Wellness Care Worth $250 for Only $45 + 4 Cans of Food! The Everett House and Common Ground Chiropractic are collecting canned food donations to support the Oregon Food Bank. In addition, you are eligible to receive services for only $45, which will include a comprehensive chiropractic consultation and evaluation, a certificate for a 1-hour therapeutic massage, and a 1-hr steam/sauna - valued over $250 for only $45 + 4 canned goods! This offer is available now through November 30, 2010 (while appointment time slots are available). For more information and/or to schedule your appointment, call (503) 232-4099 or (503) 232-6161. In an effort to reach more people and advocate for the health-supporting benefits of massage therapy, I have joined the team of LMTs at The Health Habit Gym & Wellness Center! Twice a week, from 10am to 2pm every Wednesdays and Thursdays, I will be available by appointment at the center, offering an integration of Sports, Deep Tissue, and Trigger Point Therapies. Combining fitness and massage makes for a more complete, effective, and healthy result in gaining total physical balance. Also, I value the growth it will offer me as it deepens my knowledge and experience in working with all types of physical conditioning - those who use the gym as part of their daily exercise routine and those who are training for athletic events. 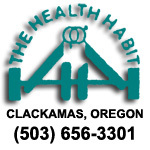 Contact the center at (503) 656-3301 to schedule an appointment with me. Also, if you've been thinking about starting a fitness regimen, speak with Thom Bowser (Fitness Director) and ask about the center's programs. Hello and thank you for stopping by! This is just the very beginnings of what I hope to be a great resource on the unlimited benefits of massage therapy, including news, updates, and milestones in the industry. So, this will be an ever-evolving site, so there are still lots of changes to come. Please leave me a note and let me know what you think of the site so far. I welcome all your constructive suggestions and recommendations on how to make this website more informative and user friendly. Cheers!